Today, there is a place known as Kanaka Bay, named after Kanaka Pete on the east side of Newcastle Island, off Nanaimo, Vancouver Island, British Columbia. Let’s look back. Peter Kakua (‘Kanaka Pete’) left his home in Honolulu in the Kingdom of Hawaiʻi for Fort Vancouver, Washington Territory, in 1853. He travelled to Victoria in 1854 but soon departed for Fort Rupert in the service of the Hudson’s Bay Company. Then, on December 4, 1868, four bodies were found in Peter Kakua’s home and the Hawaiian was missing. They didn’t have to look far, however, to find him; he was sitting beside a fire on Newcastle Island. “This petition (forwarded to the Colonial Secretary) was signed by a number of the members of the Legal profession and by a number of influential gentlemen of this city”. Being of neither Caucasian nor First Nations descent, Kakua could not be buried in any of the city’s cemeteries and was instead interred on his last place of freedom – the east side of Newcastle Island. Today, the gory tale lives on in the form of ghost stories told around the fire by those camping on Newcastle Island. 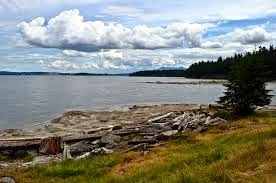 (Nanaimo Daily News) Many claim the most haunted area in the Pacific North West is Newcastle Island. The image shows Kanaka Bay. In addition, I have added other images in a folder of like name in the Photos section on my Facebook and Google+ pages.